This combination of file photos show U.S. Rep. Bruce Poliquin in 2017, left, and state Rep. Jared Golden in 2018, right, in Maine. U.S. Rep. Bruce Poliquin, who lost his ranked-choice voting argument in federal court Thursday, asked state election officials on Friday to end the recount of 2nd Congressional District ballots. In a statement on Facebook and Twitter, Poliquin said that although the recount process has confirmed he won even more votes than initially reported on Election Day, “due to the impending holidays, I believe it’s important to end the recount process” despite “unanswered questions” about the ranked-choice voting system enshrined by Maine voters in 2016 and again this year. Poliquin, who earned more first-choice votes on Election Day but lost to Democrat Jared Golden of Lewiston in the ranked-choice tabulation by more than 3,500 votes, took his loss to court last month, claiming that ranked-choice voting is unconstitutional as well as a violation of the Voting Rights Act of 1965 and other laws. He asked the judge to name him the election winner. If that couldn’t be done, Poliquin called for a new election. Shortly after he filed his lawsuit, the Republican congressman requested a recount, which began last Thursday. On Thursday, when the recount was in its sixth day, U.S. District Court Judge Lance Walker thoroughly rejected Poliquin’s challenge in a 30-page ruling. The recount of more than 296,000 ballots was progressing ahead of schedule when it was suspended Friday and so far no major result fluctuations had come to light. More than half of the ballots had been counted by the end of the day Thursday, and counters entered their seventh day with roughly 131,000 ballots remaining, Secretary of State Matt Dunlap’s office said. In a statement released after the recount stopped, Golden thanked his supporters and said he was focused on preparing to take office on Jan. 3. 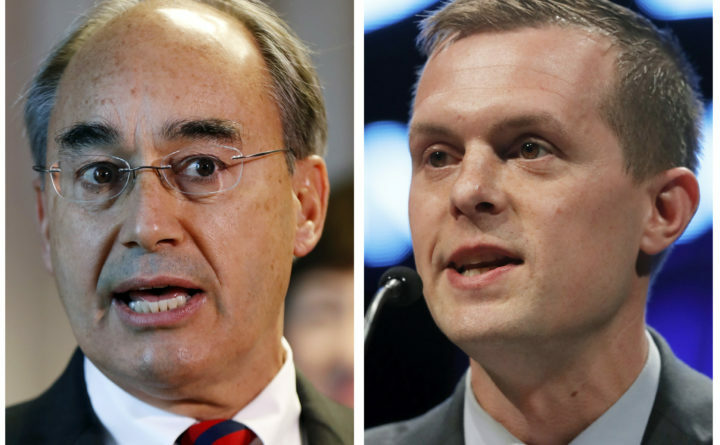 Poliquin will have to pay for the cost of the recount, even though it wasn’t completed. Dunlap on Friday said it would likely take another day to figure out what that amount will be. Poliquin’s only remaining course of action now is to contest Walker’s ruling in the First Circuit Court of Appeals — a possibility he said his team is continuing to “evaluate,” though no appeal has yet been filed.